Rhino Fleet Tracking is a vehicle fleet tracking service for companies of all sizes with integrated GPS Google Maps tracking, route management tools, after hours alerts and reporting. Utilizing the cloud-based software alongside a vehicle tracking device designed to fit the individual needs of the business, users can gain insight into their fleet and employee behavior such as routes, time spent on jobs, speed, ignition on/off reports, idle periods, fuel consumption and more. With the aim of helping businesses to keep track of their vehicle fleet and equipment, Rhino Fleet Tracking's GPS solution provides real-time updates on vehicle location using Google Maps. Users can track the exact location of vehicles at any time during working hours, receive alerts, and combat theft with increased chances of asset recovery. Rhino Fleet Tracking allows users to track routes and automatically creates a breadcrumb trail to access tracking history outlining where the vehicle or equipment has travelled. The routing system includes the features needed to ensure vehicles utilize the most efficient route possible with the aim of reducing costs and avoiding traffic. In order to provide actionable business insight, Rhino Fleet Tracking provides over 15 built-in reports including speed, location, hours of operation, idle periods, milage and more. Alerts can be automated to notify businesses when speed limits are being exceeded, vehicles are being used after hours, or when maintenance services are required. With the GeoFences feature users can also receive alerts when vehicles enter or exit designated areas in order to detect theft or misuse. Friendly Staff, Fantastic Service, Tremendous Uptime. You could not ask for better service. Tracking more than 500 drivers across the United StatesTools that easily allow us to track our drivers in real time and even allows us to see if there's anything amiss with their vehicles. 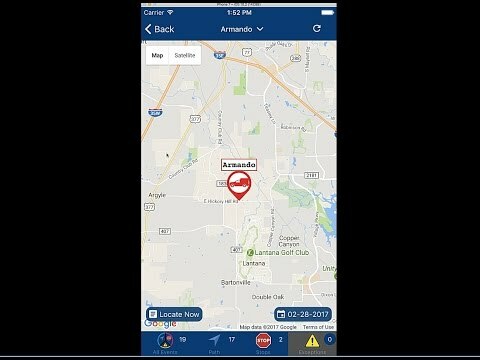 Tools that easily allow us to track our drivers in real time and even allows us to see if there's anything amiss with their vehicles. Saying there's something that I like least about Rhino's product is like asking what you like least about your favorite dessert. You really can't not like something about it... except the calories. Rhino spoils us on our services. Running drivers in the hundreds out in the field there will be times when tracking services go down (anyone in the tech field can tell you this, it's just a fact of life) however, Rhino responds to these issues whether they be in the middle of the afternoon on Wednesday or three in the morning on a Sunday. They recognize and find the issue and get it fixed rapidly. So I'm spoiled. Coming to expect that level of professional courtesy from every vendor we work with leaves me sorely disappointed. - All data from the system does not appear later so you need to download the data you want to keep to view it years later. It does give you a really good time frame but eventually the data seems to drop out where you cannot get it anymore. I own a food truck and use the tracking equipment to tell my customers where my vehicle is located so they can come to my current location. It not only helps business, it helps me know that my employees are where they are suppose to be. It also lets me know if they are safely driving while my company name is plastered on the truck. Rhino's customer service is top notch and they are always extremely helpful when I need something. If you are looking at other companies, run away! Rhino is where you need to be. I haven't found anything I don't like in the 2 years I have had their service. Works exactly how we need it to! The towns show up wrong; sometimes when you look at past history it will show a random town and the only way to know is by the road name where that device is. Also, I would use the hard-wired version next time as drivers conveniently pull out the device when they want to and say it "fell out". The only complaint I have against this program is that the Google Map is outdated with current posted speed limits, which was our main reason for purchasing a program. I'm constantly having to change my speed limit requirements otherwise I have over 200 alerts (literally) in my email box. I have submitted numerous updates to Google Maps and was wondering how long it will take before the information is updated. If you know anything else I can do, please advise me. Thank you.It is easy to use and has lots of options. It is easy to use and has lots of options. Google Maps does not have current speed limits and as a result I have to investigate each speeding alert which can be time consuming. Thanks so much for your review and feedback. We understand your frustration with Google¿s speed limit feature and share that with you. Unfortunately, Google has the most accurate nationwide speed limit system we¿ve found to date. Because of Google¿s size, they make updates on their own timeline. We usually see updates within 90 days. I¿ve passed on your feedback to our development team to audit your specific results and will reach out to you directly to gather a few samples I can share with them. Thanks again. We¿ll keep making the system better every day. Monthly subscription per vehicle ($16.95 for 3 or more vehicles with standard tracking, $25.95 for AOBRD, +$3 for fewer than 3 vehicles). $20.00 activation fee per vehicle. Contact Rhino Fleet Tracking for a personal quote. Using the HOS and ELog solutions, Rhino Fleet Tracking makes users aware of employee operational hours and can send alerts to management when a driver has exceeded drive times in order to meet FCMSA requirements. By keeping track of routes, arrival times, driving times, traffic and more, businesses can keep track of hours worked and overtime costs meaning there’s no possibility of timesheet fraud from employees. Rhino Fleet Tracking provides pre-activated and programmed vehicle tracking devices so there’s no need for users to configure and install their own device. Receive automatic notifications when vehicles require maintenance or services. Fleet managers can add personalized notes or instructions to a vehicle's record for use by maintenance personnel. The turn-by-turn vehicle monitoring system gives an overview of any given vehicle's route, speed and stops (scheduled or unscheduled) and all fleet vehicles can be viewed simultaneously regardless of location. Below are some frequently asked questions for Rhino Fleet Tracking. Q. What type of pricing plans does Rhino Fleet Tracking offer? Q. Who are the typical users of Rhino Fleet Tracking? Q. What languages does Rhino Fleet Tracking support? Q. Does Rhino Fleet Tracking support mobile devices? Q. Does Rhino Fleet Tracking offer an API? Yes, Rhino Fleet Tracking has an API available for use. Q. What other apps does Rhino Fleet Tracking integrate with? Q. What level of support does Rhino Fleet Tracking offer?